Got some extra crayons lying around? Are you a closet knitter with a room full of yarn? Scrapbooking, paper-making, jewelry-making, drawing, painting, sculpting, and more - whatever your craft is, you need supplies. Why not trade for them? 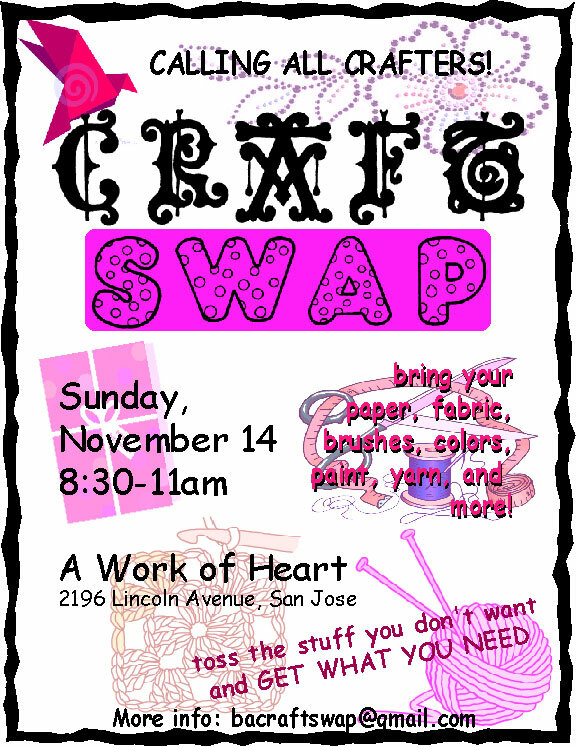 Come meet other crafters, share your extras and take home some goodies at our first CRAFT SWAP! What to bring: Arts and crafts supplies (no one empty-handed will be turned away), and an extra bag or basket to carry what you want. You'll bring in what you have, put it on the appropriate table, and go shopping for free. Can We Transition San Jose? Join us on Tuesday 11/16 as we raise awareness about Transition and starting efforts in San Jose at the upcoming Green Vision Cafe event. This event is open to the public. Free coffee, tea, and veggie samples will be provided. You are encouraged to bring your own mug.